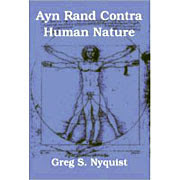 You must be an Objectivist, meaning that you agree with and live by the principles of Ayn Rand's philosophy of Objectivism as best you understand them. Actually, the question it really answers is how Rand's allegedly rational approach to defining terms really operates in practice. Oi, you lot with a bunch of unresolved topics to discuss. Well, I consider myself an expert on Objectivism, so you can run whatever fatal flaws Objectivism is supposed to have by me. I'll try to answer them in "real time"(I.E. in like a day or less, as opposed to say 2 weeks from now) That goes out to the particularly irritating, intransigent, belligerent Objectivist haters like Parille, Barnes, Nyquist, and of course Prescott. 1) Would you care to post under your real name? Most of the commenters critical of Rand here do, yet hardly any of Rand's defenders do. I'm not sure why. At any rate, it tends to be a bit more convivial. 2) Have you read Greg's book and/or many of the posts on this blog? Most of our would-be critics have done neither. If so, that would be a good start. 3) If not the above, what do you regard as good quality criticisms of Rand? Update: My next questions are posted in comments. Analytic-Synthetic Dichotomy 12: Necessity and Rationalistic Speculation. In my last post, I introduced some of Peikoff's objections to the view that all facts are contingent. Peikoff described this view as "secularized mysticism," suggesting that belief in the contingency of facts is motivated by a desire to evade reality. However, as with Peikoff's attacks on the analytic-synthetic dichotomy, we find LP once again missing the point. Historically, the contingency of facts doctrine has tended to be most popular among empiricists, not because they were fact-evaders, but because they despised rationalistic speculation. Rationalists and Idealists often use necessity to justify reasoning about matters of fact. If all you wish to achieve is to note that all bachelors are unmarried, or that all the characters of thought have identity, or that up is opposite from down, then there is no real great objection to philosophical speculation. If it is merely an explication of meanings, speculate to your hearts content. But philosophers and ideologues wish to go further. They wish to use philosophical speculation to determine matters of fact. And I'm not talking about trivial facts such as "The sun rises in the east," or "water flows downhill." No, they wish to use speculation to determine facts about the "nature of man," "necessities in nature," the usefulness and/or "validation" of inductive reasoning, and the workings of their favorite moral and political systems. In short, they wish to determine matters of fact which, even under the most rigorous scientific standards of peer review and criticism, are not easily ascertainable, by doing little more than spinning rationalistic webs. Such a method does not provide reliable knowledge of difficult-to-know matters of fact.